Speech therapy helps improve children’s verbal and nonverbal communication skills. Your child is one-of-a-kind, and his or her developmental needs are unique. 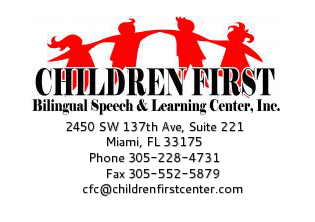 At Children First our Speech Language Pathologists work with each child and family in a motivating play setting to provide parents and caregivers with the education and tools needed to help your child meet his/her potential. Occupational Therapy is a discipline that aims to promote health by enabling people to perform meaningful and purposeful activities. The occupation of a child includes play, self-care, and school work. Occupational Therapy touches on all aspects of a child’s growth and development and addresses physiological, social and environmental factors that affects your child 's ability to function in its environment. These areas include, but are not limited to, sensory processing dysfunction, dressing, bathing, playing, academic activities, writing, eye hand/fine motor coordination and visual perceptual skills, as well as, addressing psychological and psychosocial problems that may affect his/her independence in the home, community, and school.